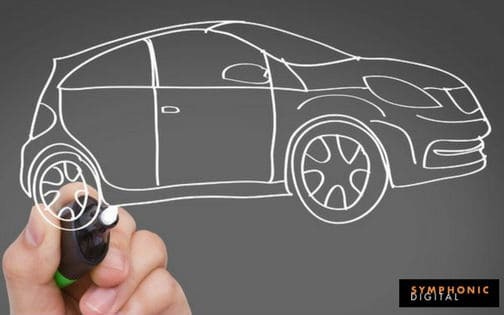 Part One and Two of A Dating Guide to Automotive Advertising covered the automotive digital advertising landscape, unveiled challenges, and introduced ideas on how to approach them. As our “dating relationship” progresses, we will inevitably run into some issues. None of these are deal-breakers if we work hard to address and resolve them. In Part Three, we’ll share tips on how to decrease the friction between your automotive search engine marketing efforts. We must understand what we mean through intent. To identify this, we look at a user’s search query and separate explicit queries from implicit. This helps us allocate the correct keyword to the correct tier based on where the user is in the buying process. If keywords are too broad to identify intent, it’s best to let Tier 1 handle the heavy lifting. 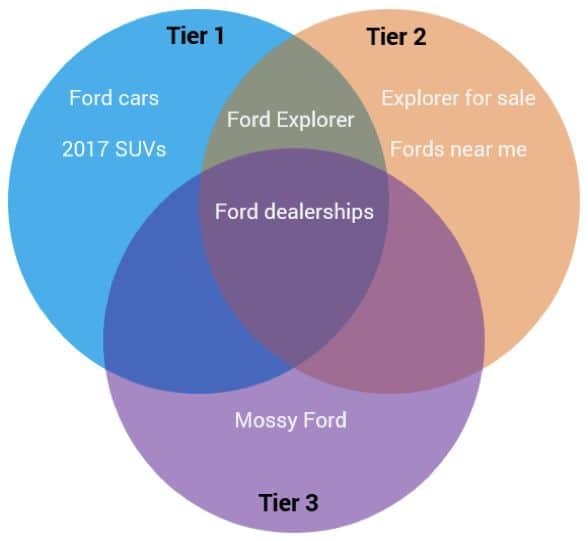 If keywords are distinct such as “Ford dealerships near me”, it’s best to promote the nearest dealer via Tier 2 and/or 3 efforts. A Venn diagram can help map intent and allocate the correct keywords to one of the three tiers or multiple. Avoid Inadvertent Conquesting – Be sure to add negative keywords to your existing campaigns and ad groups. “Honda new SUV” will match to your query “new SUV”, so you’ll want to negative out “Honda”. Be Careful with Double Meanings – In Ford’s case, we would have to be careful with “Ford Models” as that’s a modeling agency. “Ford Car Models” may be better suited. Avoid Irrelevance – Some terms may not make sense to purchase such as “for sale by owner”. You may want to make a play to shift sales to OEM’s, but if not, be sure to negative “by owner” out of your buy. For best practices on how to develop and find best keywords for SEM campaigns, please read more here. 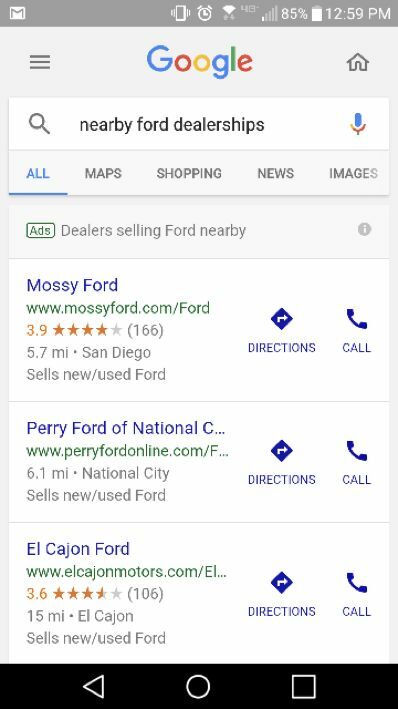 When keywords are ambiguous or broad in their meaning (e.g., “new SUVs”) we don’t know if searchers are looking to buy or something else – like doing marketing research for an automotive search engine marketing blog . For moments where it is unclear, utilize as much search real estate as possible with multiple ads. This can help users click-to-intent rather than force one option on them. In this instance, it is important for the three tiers to clearly communicate and set some ground rules for who is bidding on what ad position. Without this coordination, each tier inadvertently risks bidding against each other and increasing costs. When two or more ads are shared between tiers, showcase message variations. Saying the same thing twice is redundant. Users should have multiple options to get a seamless online experience. Sitelinks don’t always show up with descriptions. It’s best to choose a headline CTA. 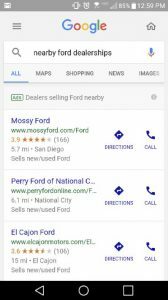 There are additional AdWords features for the automotive search engine marketing category. For dealerships, you may want to run Dealer Automotive Ads. Participating in these mobile specific ads will not only help your consumers know you exist but will also let them easily get to you with a click of a button. 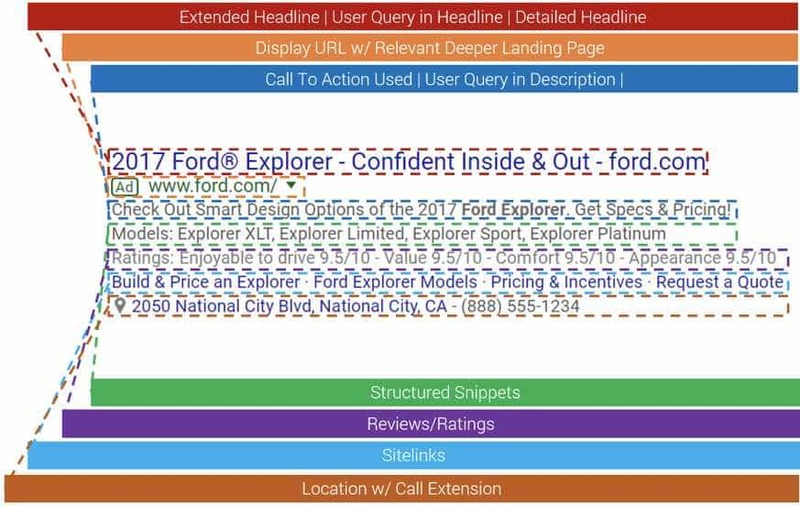 This ad engulfs the whole page above-the-fold, so even with a strong organic search presence, you may not be seen unless you utilize this extension. In addition, without sharing the same cookie pool, we often double-count credit across tiers. Consider utilizing an attribution technology such as Adobe or Google Analytics to understand efforts holistically. You may not have one agency managing everything, but communication between the different entities is key to success. In addition to sharing goals, objectives, coordinating bids and positions, data and technology can also help streamline your efforts. This will increase efficiency, and make your data more accurate. Next time we’ll focus on additional digital channels. If you want to learn more about how Symphonic Digital can help you, feel free to contact us. We’d be happy to conduct a free campaign diagnosis.